These stereo recordings were made in London by Decca for issue domestically in the UK in May 1960, a few short months after London Records issued them in the USA. At the time there were four release formats - the 33rpm long playing vinyl record, in mono or stereo, and the quarter-inch open reel tape, likewise available in mono and stereo formats. Both had their merits and their shortcomings - LPs may suffer from surface noise, clicks, ticks, crackle and so forth, as well as end of side distortion, swish, off-centre pressings and so on. Tape would therefore, on the face of it, have a number of advantages, with none of the above being an issue. However, in the pre-Dolby days tape hiss was a perennial issue, frequency range was sometimes slightly less than that of the LP, magnetic drop-out was a risk, as was tape flutter and - as with the LP - simple wear of the magnetic surface. The present recordings were transferred from quarter-track stereo open reel Ampex tape at 7.5 inches per second, issued commercially by London in the USA. A Revox B77 quarter-track machine was used for the transfer, perhaps the highest quality tape deck ever made for this format, which rarely saw professional use. Beyond the aforementioned tape hiss, which has been gently but significantly tamed using digital noise reduction, the tape also suffered from a surprising amount of very-low-end rumble and a tendency to mild distortion during brass peaks, both of which have been dealt with during restoration. Frequency response generally was excellent, and the overall tonal balance remains largely faithful to the superb original. and in the UK as Decca SXL2176 (and in mono as LXT5550) in May 1960. The two works on this disc have much in common. Both are sets of variations on some well-known tune, each treats its theme rather liberally. They are as close to piano concertos as can be, but what distinguishes them from a concerto is the goal: the emphasis is not on the piano writing, but on the development of the music itself - the piano just happens to be the forward player. 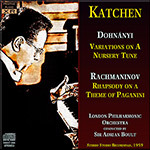 The Variations on a Nursery Tune by Dohnányi start with a brooding introduction, as if extracted from a Brahms symphony. It is full of grand gestures, blaring brass, full orchestral attacks, and does not hint at what will follow. No sign of a variation yet: its motifs are not based on the main theme of the work, except for the phrase of the horns. Instead, the music seems to come from the drafts of Wagner or Franck. The theme then comes as a big surprise - what? that's what it is all about? Mozart already based variations on Ah, vous dirai-je, Maman (aka Twinkle Twinkle Little Star), but then the theme was not surrounded by such seriousness! The theme is presented very simply, with minimal accompaniment. The variations are extremely diverse, passing through an array of late-Romantic styles. Starting with merry runs of the glimmering piano, through a burlesque with brass calls, we arrive at a sensual and suave waltz which mixes Richard Strauss with Tchaikovsky. This is followed by a healthy, rustic scene a-la Dvorák, then by the song of glittering silver bells, and by a prankish quarrel of high woodwinds. Another grand waltz - this time noble et sentimentale, just as Ravel would have had it. A fast march, with dark wood-notes of bassoon and odour of boots and rifles, evokes the Tralali, Tralalei, Tralala of Mahler. After it Holst's Uranus is mixed with some young Shostakovich for a jumping, sharply accentuated and mischievous episode. The resemblance to the theme is barely heard by now. After a Brucknerian brass chorale, the strings sing a warm Romantic melody that could fit a Rachmaninov concerto. The swirl is tighter and tighter, the music becomes anxious and frenetic, the wave rises and erupts in a powerful Wagnerian climax. The next variation is reminiscent of planetary mechanics - grandiose and elegant. Next comes the golden filigree, with transparent lightness and joie de vivre. Suddenly the theme returns and reminds us how simple the source of all this richness and variety was. A short, jubilant ending wraps all up. If it is your first introduction to the Dohnányi Variations, you should be aware of its subtitle: “For the enjoyment of humorous people and for the annoyance of the others”. In all the faux pathos of the Wagnerian introduction, the pregnant pauses and the overexcited climaxes, the composer is jesting, making fun of almost every name popular in 1914. Katchen enjoys wearing all these masks, and plays with bravura and character. Together with Boult, they produce sparkles and a lot of fun. The same forces in the same year and venue recorded Rachmaninov's Rhapsody. Unlike Dohnányi’s work, this is a developing story, like music to a ballet. The variations are bold and adventurous, projecting the famous theme by Paganini in all possible directions. Its demonic and lyrical sides are explored all the way to deepest abysses and highest peaks. The Dies irae motif is recurring, as it appears to be a close relative of the theme. We spend much time in the midnight world of the Symphonic Dances. The episodes are not separate, as in Dohnányi Variations, but form a cinematographic chain of scenes - ghostly, heroic, sinister, triumphant. The orchestration is colorful and inventive. The performance is rather on the "fast and furious" side, the piano is recorded closer than on Dohnányi, and its sound is grand yet beautiful. The entire work is done compactly and coherently. The coordination between the soloist and the orchestra is excellent, both rhythmically and dynamically. The 18th Variation is not over-sugared. The last few variations are performed with white-hot intensity and are positively mind-shattering. All in all, if somebody wants to have just one single version of this work, this recording could be an excellent candidate. I may be wrong, but it seems to me that these are the same performances that were recorded by Decca/London and issued in the Julius Katchen II volume of the Philips series "Great Pianists of the 20th Century" (those brown "books"). However, the sound quality is definitely different, as the Pristine record benefits from an XR re-mastering by Andrew Rose - a new transfer from the original tapes. While the difference is not radical, it is noticeable if you compare side by side. The Decca/Philips record has more tape hiss, but the sound there is more unified. The tape hiss was tamed on the Pristine record - not completely, and is still rather noticeable in Rachmaninov. The Pristine sound is deeper; the music suddenly acquires more dimensions. Rachmaninov in particular became even more spectacular. The surrounding ambience is rather "dead" in Philips, more "alive" in Pristine. This is all great, but at the same time the minor fluctuations that were veiled before have become more apparent now. Andrew Rose in his restoration notes mentions a tendency to mild distortion during brass peaks, and I still hear it. So, the new restoration is better for loudspeakers, but probably worse if you listen via headphones. Also, Pristine put each work in a single track, while Philips has each variation on a separate track, which is more convenient. Philips also has the benefit of the company: the generously filled double-disc set also contains both Ravel's concertos, Liszt's Second, Prokofiev's Third, Rhapsody in Blue and a rondo by Beethoven - a true constellation! If you already have it, you probably won't need this new release. The liner-note is minimal and not very informative.